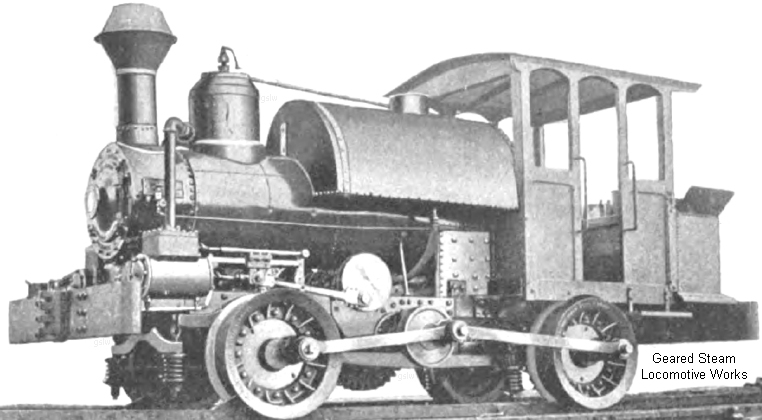 There were several more geared steam locomotives of varied designs and sizes produced. With a few exceptions, most were produced in small numbers. They were typically made by small companies or concerns in an attempt to fill a specific niche of the demand for geared steam locomotives. Some are one of a kind units being assembled, built, or cobbled together by the locomotive's owner or their employees. Home made, sprocket gear, and chain driven. Ran on wooden rail. The company was a producer of lumber. 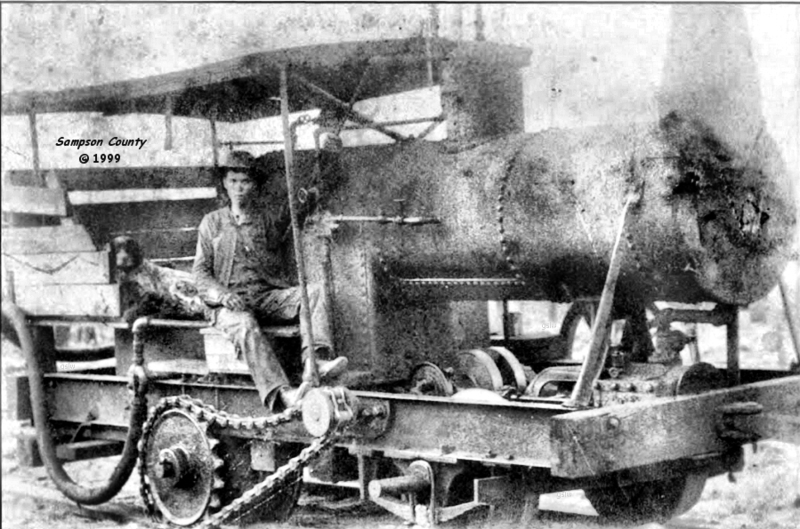 The locomotive appears to be a "sprocket and chain" drive system with two horizontally mounted steam cylinders and vertical boiler. 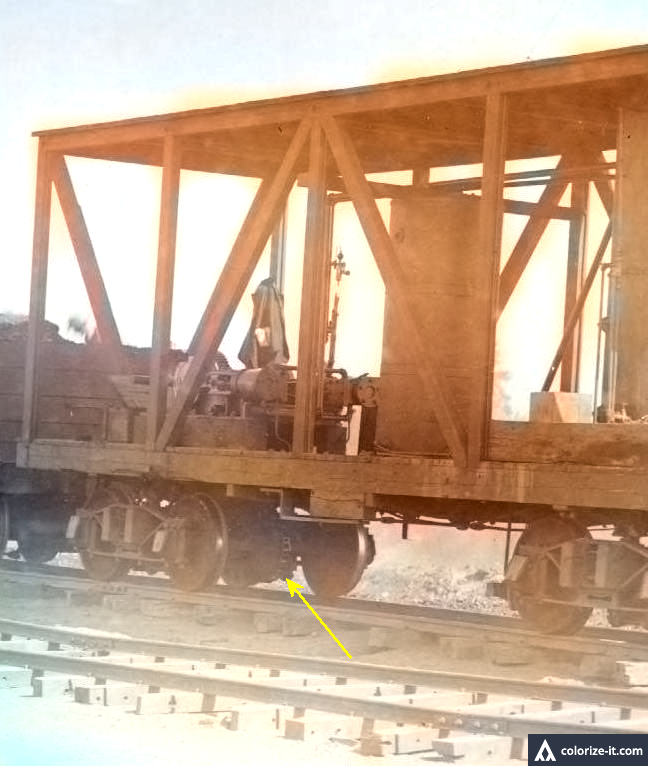 The yellow arrow in the lower images points to the location of the sprocket and chain. 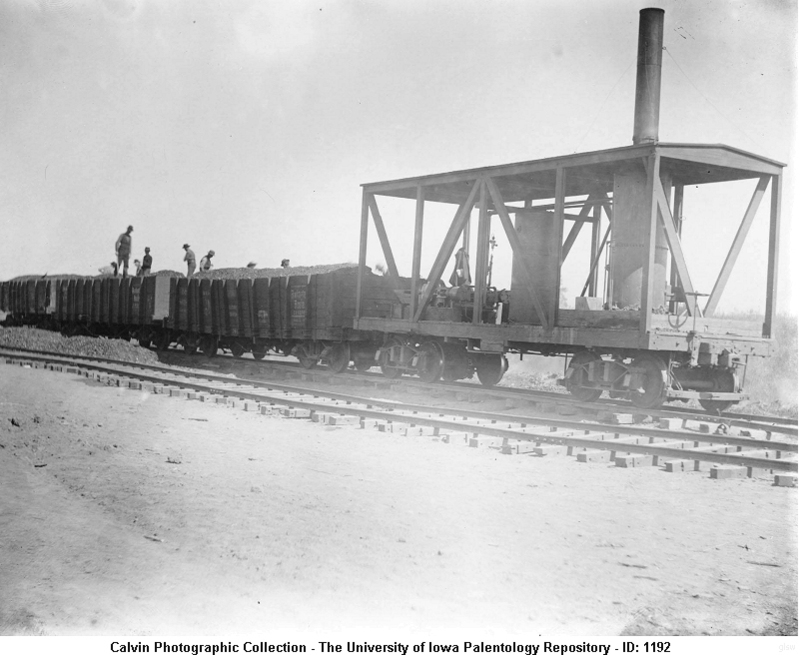 The photo (ID 1192) is part of the Calvin Geological Photographs collection hosted by the University of Iowa Libraries. We thank John Taubeneck of Seattle, Washington for notifying us of this photo's existence. The locomotive, named "The Jesse", is depicted in the photo taken October 12, 1900 at the construction site of the Wachusett Reservoir, Worcester County, Massachusetts. 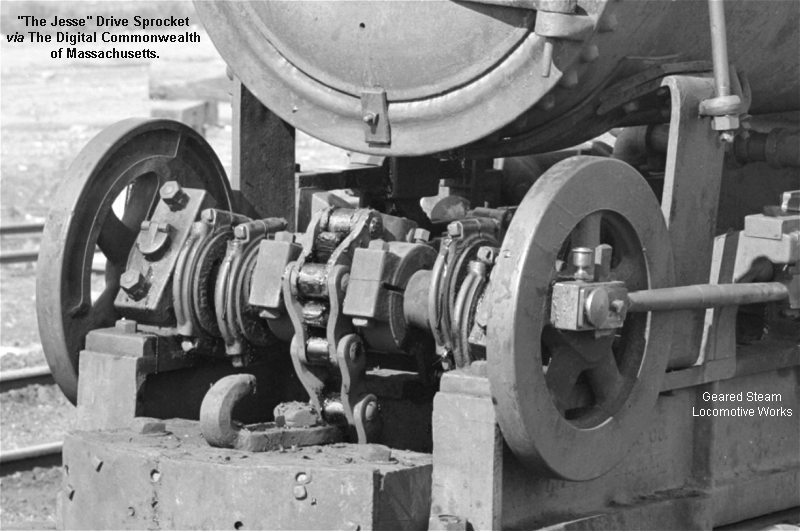 The locomotive appears to be a "sprocket and chain" drive system with at least one horizontally mounted steam cylinder. Photo credit: Goodman, George P. via The Digital Commonwealth of Massachusetts. We thank John Taubeneck of Seattle, Washington for notifying us of this photo's existence. 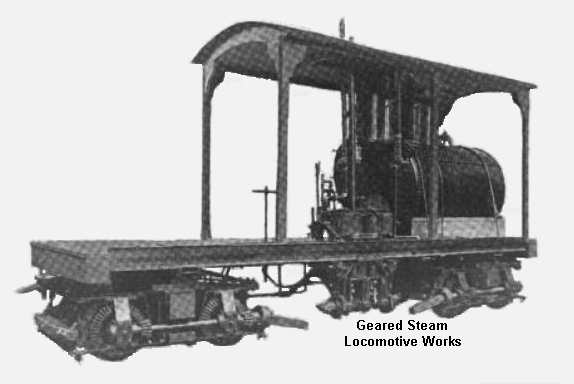 This image appeared on page 377 of the August, 1899 issue of Railway and Locomotive Engineering. Builder: Washington Iron Works - Seattle, Washington. 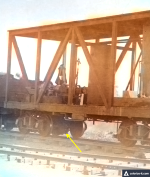 The locomotive had two 8" X 8" vertical mounted cylinders. It was equipped with drive shafts, universal joints, outboard gearing on the driving wheels, and trucks that resembled those employed on a Shay geared locomotive. The boiler was of a 60"x96" internal furnace type. The steel frame spanned 24' in length. It was equipped with a steam brake and reversing gear. As shown, the drive shafts were uncoupled. This image and accompanying details appeared on page 32 of the June, 1910 issue of the "The Timberman" periodical. 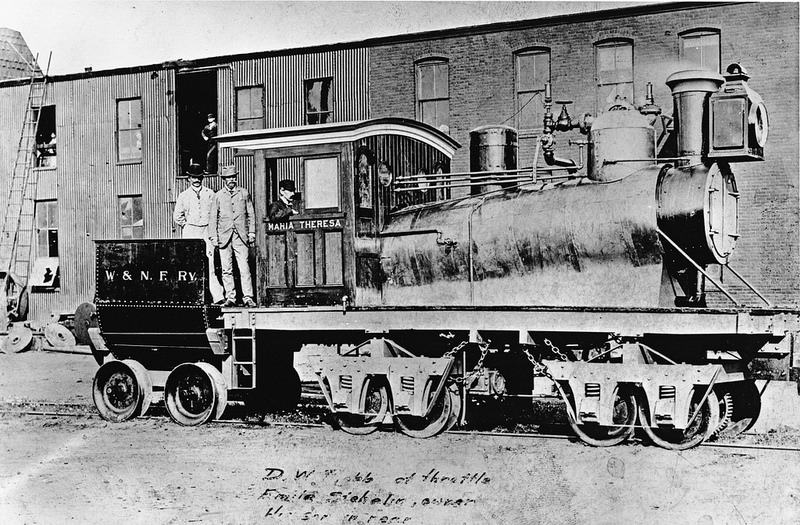 It is believed to be the only locomotive the company built. 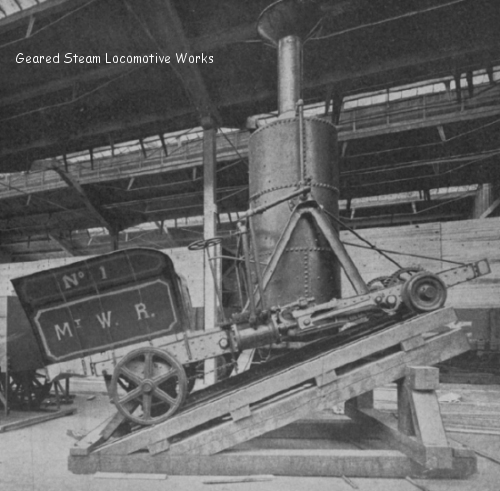 This image and accompanying text appeared on page 313 of the book "Development of the Locomotive Engine" - by Angus Sinclair. The book was published in 1907 by the Angus Sinclair Publishing Co. of New York. 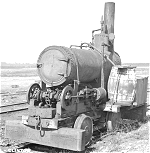 This locomotive was promoted as a "Contractors Oil Locomotive". Image from "Engineering and Contracting - Volume 43 - January-June 1915"
Note the geared drivers to the rear of the standard large spoked drivers. Look for patent #882,618 for this locomotive on the Other Geared Patents Page.